The main objective in the germination of Ensete ventricosum is to provided yourself with a constant supply of decent sized plants. Most greenhouses are not tall enough to accommodate very large plants, so when it's time to say goodbye to your second/third season ensete's, you will have a few one year olds to replace them with the following year and so on. Sowing seeds in individual pots has resulted in germination rates varying from as low as 10% to as high as 85%. 3 to 5 germinating seeds out of a packet of ten should satisfy most requirements unless you have a vast garden and an enormous greenhouse. The germination of Ensete Ventricosum is somewhat erratic. 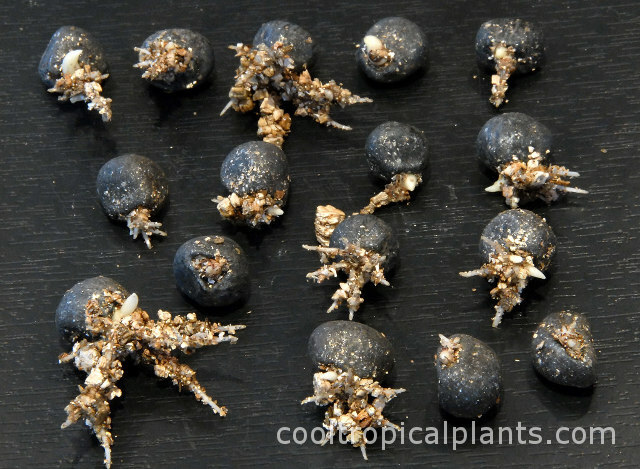 You can not depend upon plants germinating this year for your current garden plan. 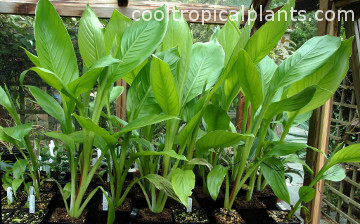 Growing Abyssinian bananas in succession and therefore knowing what you have in stock makes planning your garden easier. The young plants can be either kept in pots for the first season or used as part of the general display. Even plants in their first year can make reasonably impressive growth, given the right level of pampering. Planting them in the garden also reduces the amount of pots that need watering and as a result reduce your stress levels when on holiday. Seed catalogues usually come out just before Christmas. Order your seeds from catalogues or on-line. Start the process as soon as your seeds arrive. Soak your seeds for a couple of days. Fill a clean 3" plastic pot with multi-purpose compost. Pour boiling water over the compost to sterilize and allow to drain. When the compost has cooled, push one seed into each pot, about as deep as the seed is large. Plant each seed individually. Each seed can then have its 'own space' and germinate when it feels ready. Next you can either place the pots directly into a heated propagator or you can seal each pot in a clear plastic bag (freezer bag.). These can either be placed in a heated propagator or the warmest place in your house. Plastic bags have the advantage of preventing the compost from drying out. If you place your pots directly in the propagator, pour enough liquid to keep the propagator base moist at all times. Be patient. The first seeds may begin germinating in as little as a week or considerably longer. 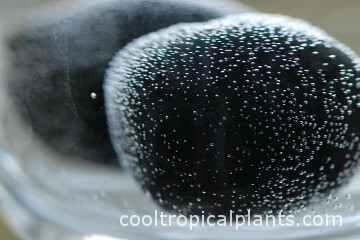 Don't check your seeds every day, just keep a check on the moisture level in the propagator. Warm and wet is the key. Eventually you will be greeted by a shoot. Now is the time to move the plant into a well lit spot. South facing windows are a little intense and can cause the pots to dry out too quickly. This method proved quite successful with a 50% germination of Ensete ventricosum rate after one month. It was marginally successful with Ensete glaucum and made almost no difference with Ensete superbum. The Baggie method is described in detail here. (There is also a link at the end of this page). Results for all seed experiments using the Baggie method here. In the greenhouse place your newly germinated plants in plastic trays. Water from below i.e. pour water into the tray and allow the pot to soak it up. If the prevailing weather conditions are poor with cloudy days and low temperatures, water sparingly. Especially in winter. Use warm water, it is enough of a shock being germinated in a British winter without, on top of all that, being doused with icy water. The young plants will grow and the danger of frost will pass. It is time for them to come out of the greenhouse and feel the sweet, sweet rain on their leaves for the first time. If you decide to incorporate them into the general display, plant them as usual in a well prepared hole using plenty of home made compost and composted manure. Allow them to enjoy the summer. As winter draws near, you will need to rescue them from a certain and unpleasant fate. Dig the young plants up. Trim back some of the longer roots so they will fit into a modest sized pot. Fill in any spaces with some form of multi-purpose compost. Do not think that you will be doing the plant any favours by sticking it in a large pot. For some reason they object to this and become quite un co-operative the following spring. Over winter, keep the plants on the dry side but do not let them dry out completely. They are not cacti. If you elect to leave the plants growing over summer in pots, again do not put them into too large a pot. Pot them up as and when necessary during the growing season but again keep the pot on the modest size. Move the plants inside the greenhouse before the first frost. Maintain the same watering regime as outlined above. Occasionally the following spring, you will have a strike on your hands. The weather may be perfect. Sunny days and mild night time temperatures, but your plants refuse to grow. 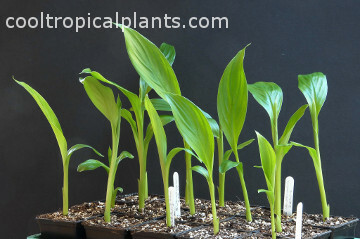 Newly germinated Ensete Ventricosum and other plants are racing ahead but not your one year olds. Even gentle bottom heat from a heated mat will not coax them out of their slumber. This calls for drastic action. Lift the stubborn plant by its stem. Remove the pot with a gentle tap on the rim from a trowel. Pull off most of the compost (do this over a bucket) and pull away any black or brown roots. Leave any nice white healthy looking roots. Re-pot the plant in the same pot. Let the plant rest (ideally on a heated mat) and soon it will be on its way.